At long last, Griff has a home! This is the amazing news that we hinted at yesterday, and sure enough, there was not long to wait before finding out who the lucky dog would be. DRC has been trying to help Griff find a home for some time, and his photo and his story has been shared far and wide, but for some inexplicable reason, no one has been interested in him. This handsome dogs has been at the ScPA since October 2017! To recap; Griff and his siblings were locked in a garage for their first two years, until their owner finally relented and brought them to the refuge. Naturally all were unused to human contact, and socialising them was very much a labour of love, carried out by employees and volunteers. Griff made slower progress, but he too has become a different dog since making it to safety. Why no one wanted to adopt him remained a mystery, however. But then came the miracle he had been waiting for. Audrey, a member of the ScPA board decided to open her home and her heart to another needy soul. 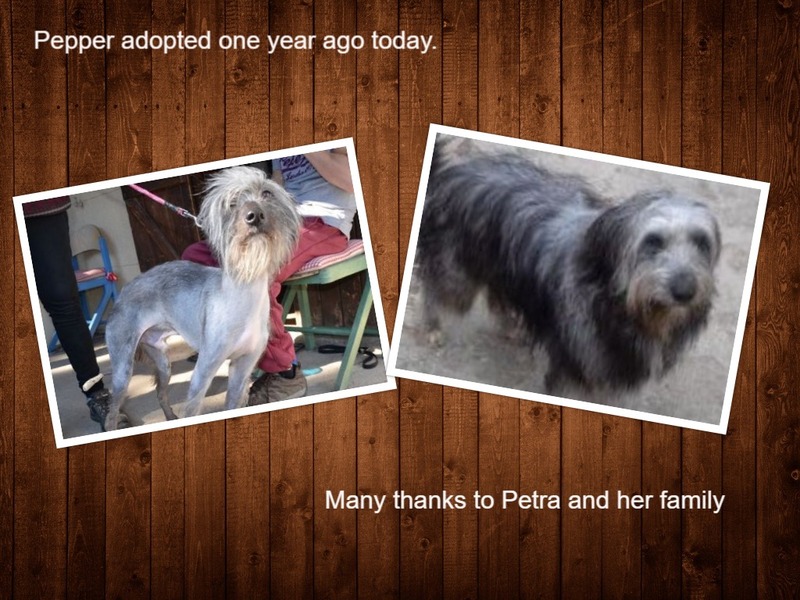 For those of you remember, she adopted Phoenix, a griffon / border collie cross whom she had seen being abused by his owner on almost this very day in 2014. Now it was time to expand the family. And wanting to adopt a dog who needed her, Audrey and her partner chose Griff. So yes, this boy has had a long wait, but Griff’s problems are well and truly over. His ScPA “champion”, Phil shed more than a few tears as he left, whilst at the same time knowing that Griff could not possibly be any happier, and of course that we will get regular photos and news. Just look at his face, as he leaves the refuge! So it was a fabulous Easter Day for one dog, and as the refuge is open tomorrow too, maybe the Easter miracles are not over. After a fairly quiet week in terms of adoptions, today was a bumper day, with four adoptions and two reservations! First to leave was Minus, one of two brothers who arrived together at the end of January. Both are stunning, though, and although a bit nervous when they arrived, are now doing really well. Minus’s new family came to meet the dogs last week, and although Minus was the lucky one, it could easily have been his brother, Cortex. Hopefully he won’t have too long to wait, either. Next we said farewell to Dionysos. 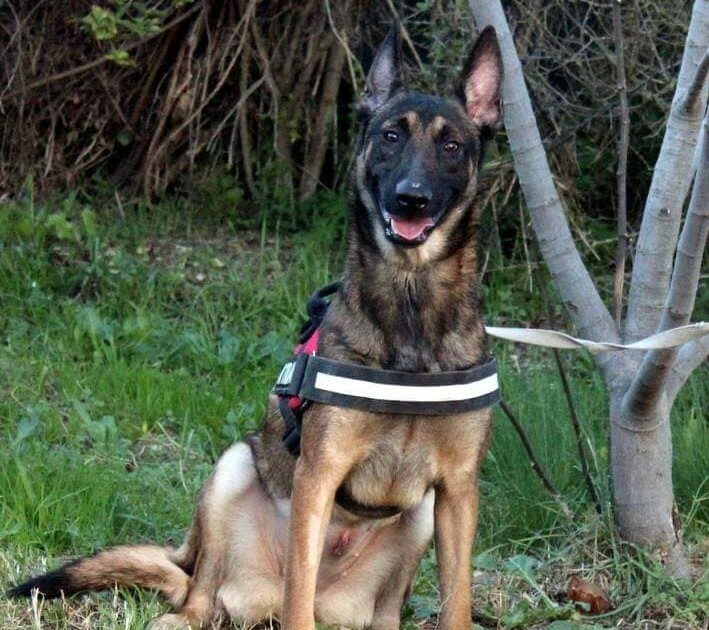 He is one of our Greek Gods, the 6 dogs who arrived together in early February. And what a fabulous looking lad he is. 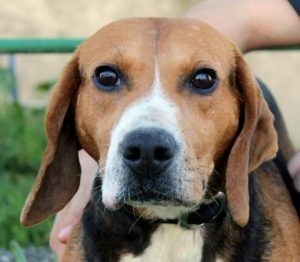 There are quite a few beagle lovers at the ScPA at the moment, and today’s family are yet more fans of this breed. We wish Dionysos a long and happy life and as with Minus, we hope that Dionysos’s remaining family members find new homes soon. Asterisque was next to leave, and to be honest everyone was surprised that it took this little girl so long to find a new home. 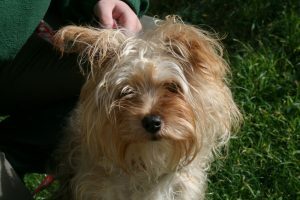 Statistically the dogs who are most often requested by potential adopters are small young females, and Asterisque, a 14 month old yorkie cross, ticked all three boxes. The fact that she is fine with cats made her perfect in every way for the family who rushed along to adopt her today! Fare well , little girl. And last but by no means least, today saw the adoption of Coca. 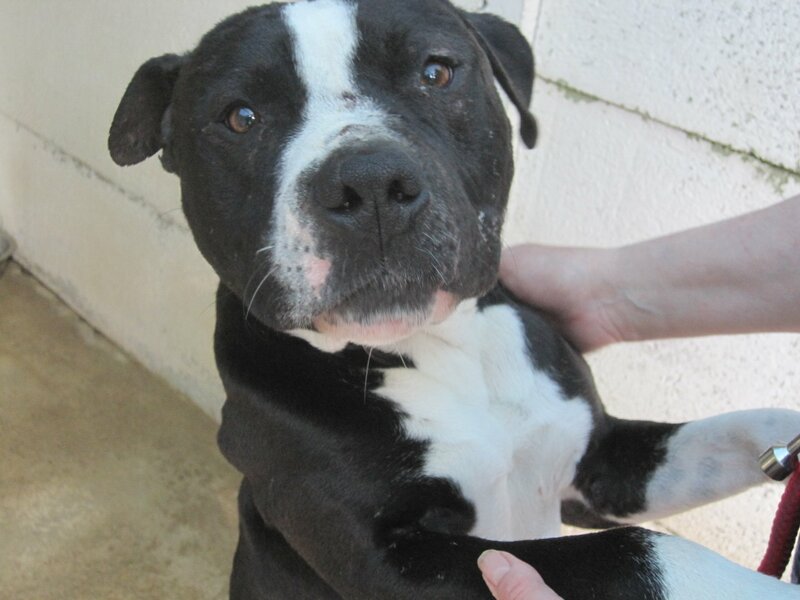 Although he was brought in as a stray, this young dog was identified. 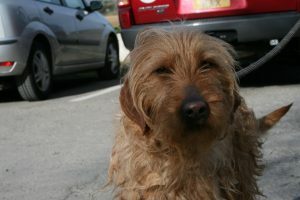 However his owners did not come to collect him, despite being informed that he was at the refuge. So, as ever, the best thing is to find another home, and under 4 weeks later, this is what Coca has! We wish him and today’s other leavers long and happy lives. All in all it was a great Saturday. And the weekend is not over; the ScPA is open both tomorrow and on Monday. Plus all being well we will have some great news for you soon. I did mention the two reservations, didn’t I? Well, watch this space! Have a wonderful Easter Day, and remember, no sharing your chocolate. Well, not with your dogs, that is! 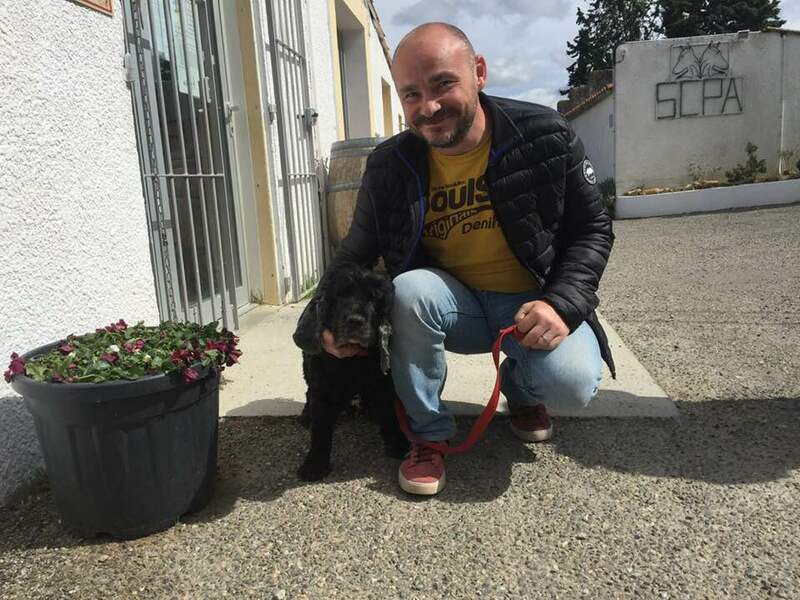 Well, today didn’t bring about a huge rush of adoptions, but there was a reservation, and one little dog left for a lovely retirement, which is very good news indeed! Boule arrived last month; a tiny cairn terrier who is still identified in the name of the pet store from which she was bought when she was a puppy almost 13 years ago. 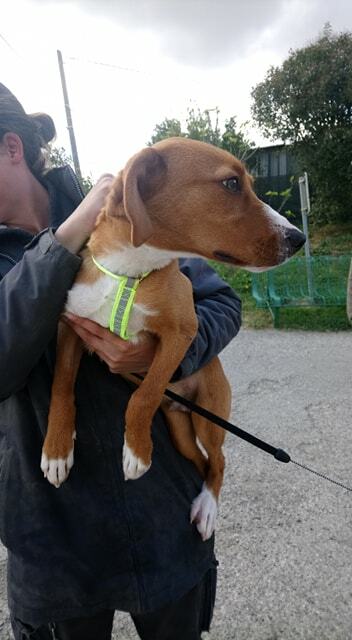 It is strange that the ownership documents have not been changed, and perhaps even stranger that no one was looking for this lovely little girl. Okay, she does have a couple of medical issues, she is blind in one eye meaning she turns in small circles from time to time, but she loves a walk and a cuddle, and although a bit scruffy, she is in pretty good shape. Sad though it is, like the majority of dogs who arrive, we will probably never know what brought Boule to the refuge. However after a certain amount of time (legally 10 days, but Boule has been there longer,), the best thing to do is to find a new home. Boule has been living in the infirmary, naturally, but that is not as good as a home of her own. And as of today, that is what Boule has! Cyndy used to volunteer dog walk at the refuge, but lives a bit too far away for this to be a regular thing. 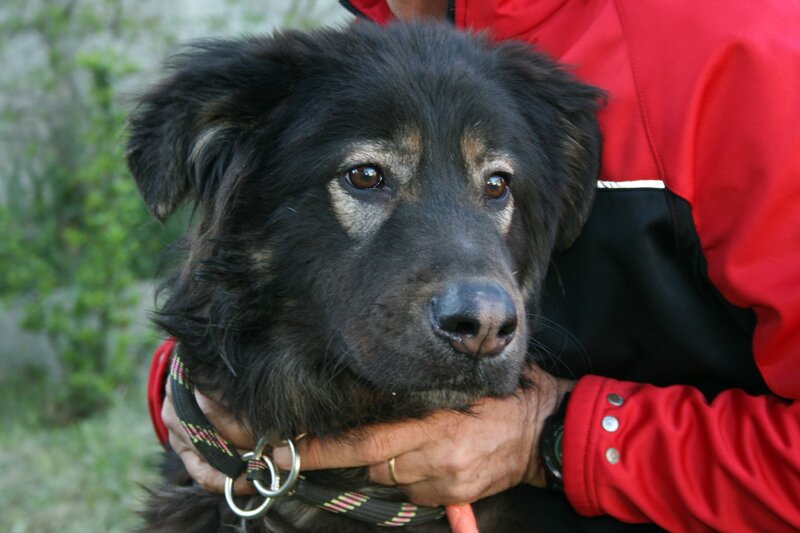 However she continues to follow DRC, and has always said that she would like to foster an old dog. Today she came along with her boy, Bailey, to make sure he and Boule would get along. Cyndy often dog sits for friends, so she knew Bailey would be fine, and Boule was her usual happy self, trotting along gently. Far from regarding Boule as being with her for end of life care, Cyndy sees no reason why Boule should not join them in Spain next winter, and has plans to make sure she has as full a life as possible from now on! 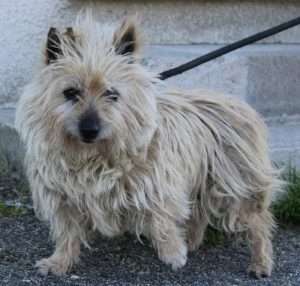 So she will be another of the regions very active retirees, just of the canine variety! Many thanks to Cyndy and we will pass on news and photos in due course. Tomorrow is a Bank Holiday in the UK, but not so in France, and the ScPA will be open as usual. Perhaps there will be more good news then. After a couple of days without any adoptions, today saw the departure of Toons. 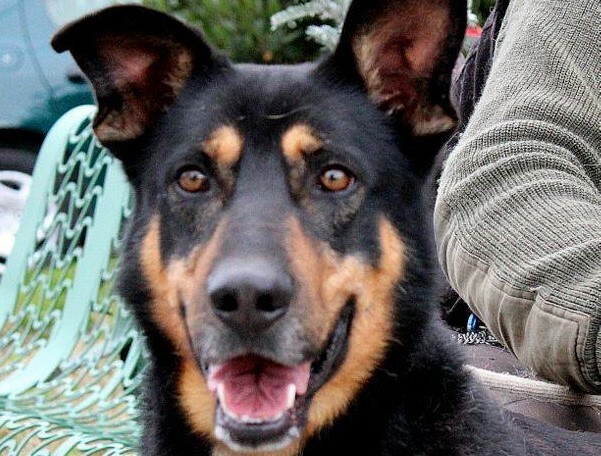 This young and very lively beauceron cross arrived just before Christmas last year as an unidentified stray. Toons is fine with other dogs, but he needs far more exercise than he could get at the refuge and was quite frustrated a lot of the time. It can be difficult for any dog to settle into life behind bars, even when there are regular walks and playtime in the parks. 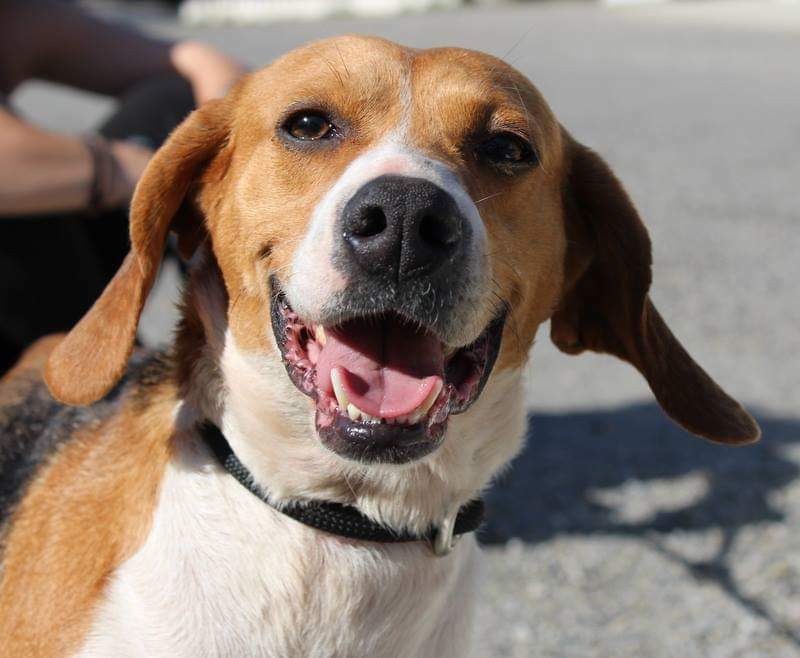 As with the majority of dogs who arrive at the ScPA, we have no idea what sort of life Toons lived beforehand, but the chances are he was used to a lot more exercise than he has been able to have at the refuge. And the problem is always the same, the fewer walks a dog gets, the more excited he is to be out, so the more he pulls and the less inclined volunteers are to take him out again. It is a real vicious circle. I don’t know how many times we have told people that dogs do not pull on the lead, only to watch them be towed down the road! 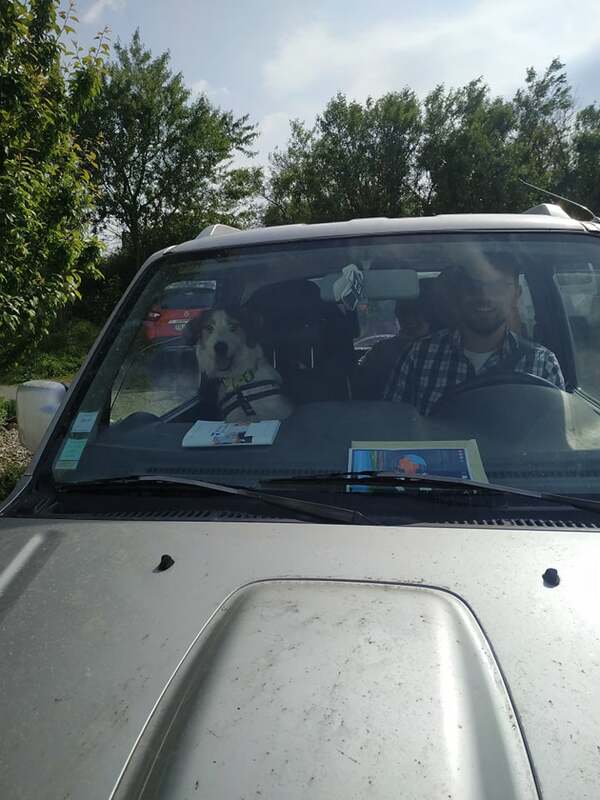 Luckily most of the dogs remember their manners with more regular outings, and this is yet another reason why the volunteers are so precious! Today it looks like all that frustration is over for Toons, as he now has a new home. His new family have been to visit him a few times before deciding to adopt him, they wanted to make sure he would be okay with their children. They are experienced owners, and are confident that they can channel Toons’s energy, and we all hope he will be a very happy boy! It has been a couple of days since we last had an adoption, but today that all changed, and so we will tell you about that, plus catch up on some other news that we have been itching to share. Fauve de Bretagne cross Rusty arrived at the ScPA as an unidentified stray in late February, and proved to be a wonderful lad, fine with other dogs and cats, and not at all nervous of people. He really is a gentle young lad, and we were all wondering when someone (other than employees and volunteers) would spot him. On Tuesday a gentleman came to the ScPA to meet Rusty, whom he had seen on line. He loves dogs of all shapes and sizes, and had only recently lost a dog to old age. So Rusty already had a fan today when the man’s partner came along to meet him too. She is the one who will be spending more time with the dog, so it is only fair that she got a say in things, even though she, too, loves anything canine. 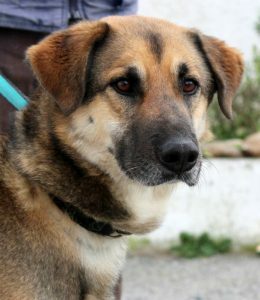 Of course Rusty was as charming as ever, and has left for a home with plenty of walks and plenty of company. Many thanks to his new family and we hope he will be very happy. In other news, Nesquick has been adopted from the ScPA in Montpelier. Of all the dogs who left for there or Belgium, he was the one who had been waiting the longest; some two and a half years, in fact. So this is fabulous news. Also on Thursday it was the first anniversary of the adoption of Pepper (ex Denver) so we thought you would like to see this before and after photo of him. What a difference a bit of hair can make! Today brought joy to little beagle Ambre, who left for her new home. She was one of the 6 hunt type dogs who arrived together at the beginning of March. 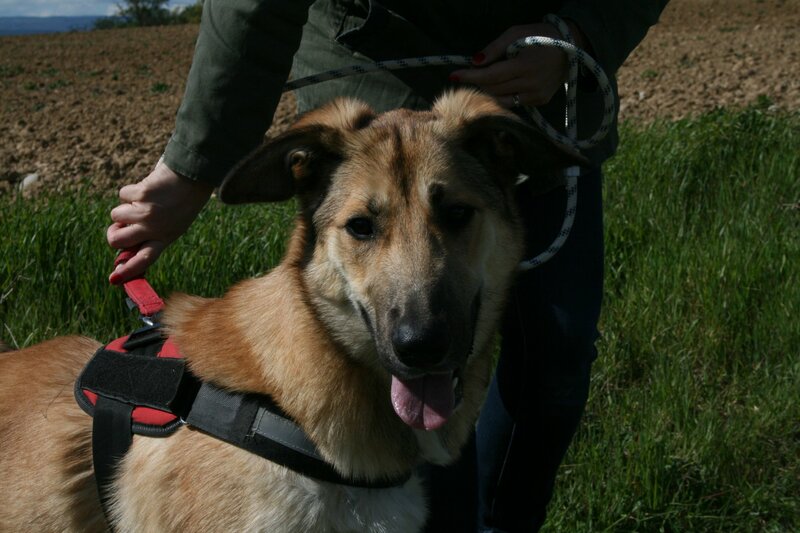 Like her brothers and sisters she is a fabulous young dog, and at less then 18 months old (estimated), had every chance at finding a new home. Of course there are lots of fabulous dogs at the refuge right now. But as we always say, it is just a question of the right people coming at the right time. And it certainly looks like Ambre has fallen on her feet big time! Her new owner is training to be a canine osteopath and will be able to take Ambre to her college with her. 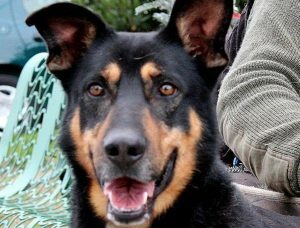 Not only that, Ambre will have a German Shepherd as a pal, so she won’t miss her ScPA kennel mates too much, if at all. A dog who was brought in yesterday and who attracted a lot of attention on Facebook was reclaimed. She had been named by the ScPA and much to our amusement her real name was Lady. So they were in the right subject area, they just promoted her in rank a little bit! 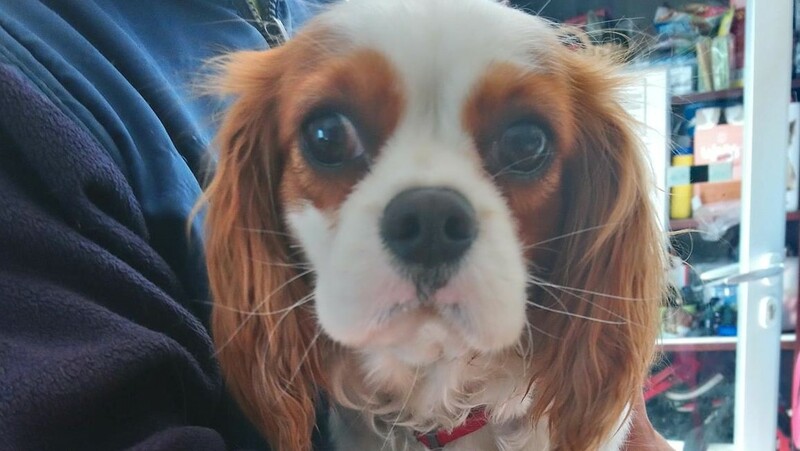 Lady’s owner was very relieved to find her safe and well, and this shows yet again the importance of identification, and crucially, keeping your details up to date on the database. Today was a great day for Pomy; after nearly three months at the ScPA she left for a new home. She is yet another dog who was very lucky to have made it there. 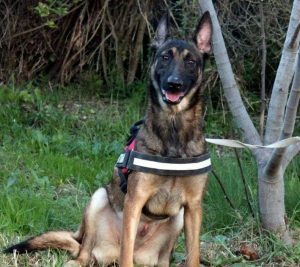 She and two other dogs were left alone in an apartment when their owner moved house, and had they not been rescued who knows what would have happened. The puppy of the trio, Popy, was adopted soon after the three dogs were legally allowed to be rehomed, and some two weeks later it was the turn of Pomy. Despite the neglect they suffered before their arrival at the ScPA, all three dogs are beautiful and well socialised, and we hope that border collie Poma doesn’t have too long to wait either. As for Pomy, however pretty she looks in this photo, she is far more beautiful in real life, and her new owners, who have walked her many times, are totally smitten. And who would have guessed that she would be so good with cats? Certainly not me! We wish Pomy a wonderful new life and look forward to news and photos. Also this afternoon a newly arrived (and already identified) dog was reclaimed, and further afield, we have news of the adoption of Chippeur from the SPA Montpelier and of Douce in Belgium. So it was a good Tuesday all round. It has been calm for a couple of days, but Friday has brought three wonderful adoptions, so here we are to bring you the news! First to leave today was Artemis. She had only recently arrived, but she was on her way to becoming one of the refuge’s many hidden gems. 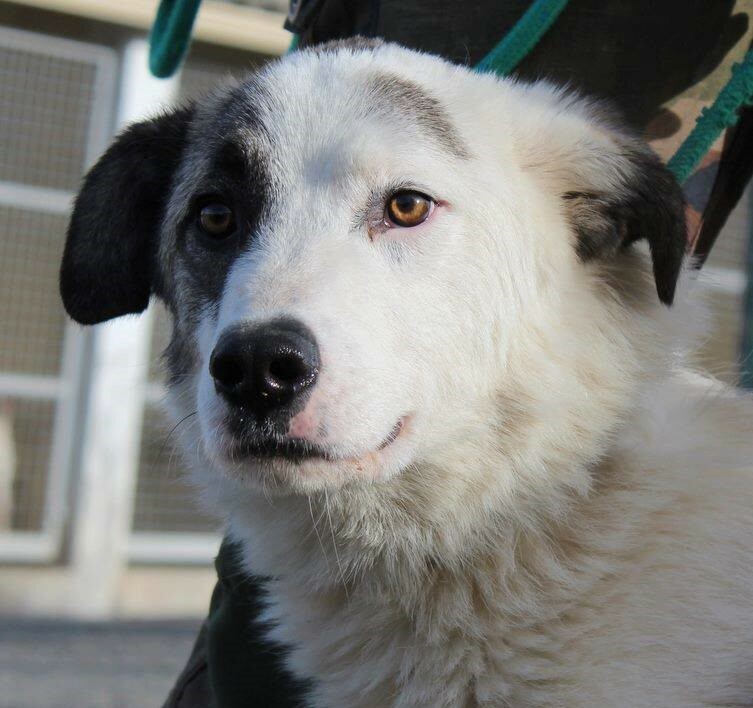 As soon as this young shepherd cross was out of the pound, she began sharing her box and fitted into refuge life so well that it looked like she had been there for ages. This is good in some ways, of course, as she was as happy as a refuge dog can be, but not good in that she risked staying for some time, as despite being beautiful, she has the same look as many other dogs. One great thing about being a regular walker is that, like the staff, you can get to know the dogs quite well. And it was thus that volunteer Corine chose Artemis. After months of walking all sorts of dogs, Corine just knew that Artemis was the one for her. And we can see why; Artemis is fabulous. And of course we will have lots of news of her in her new home. Next Jaffa. His name may be familiar to you; it has been in the blog a few times recently. Adopted 4 weeks ago, Jaffa was brought back last week from a failed adoption. As is usually the case, it really wasn’t his fault, rather a mismatch of owner and dog. Despite being fine with other dogs, Jaffa can be a bit reactive on a lead when passing them, and sadly his new owner was not able to hold him. 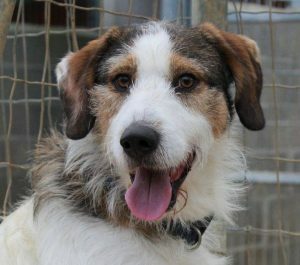 It is great that he has found a new home so soon, and we hope he finally has the stability he needs and deserves. And in a nice aside, since his return he has been sharing with Artemis, so it is sweet that they left on the same day. 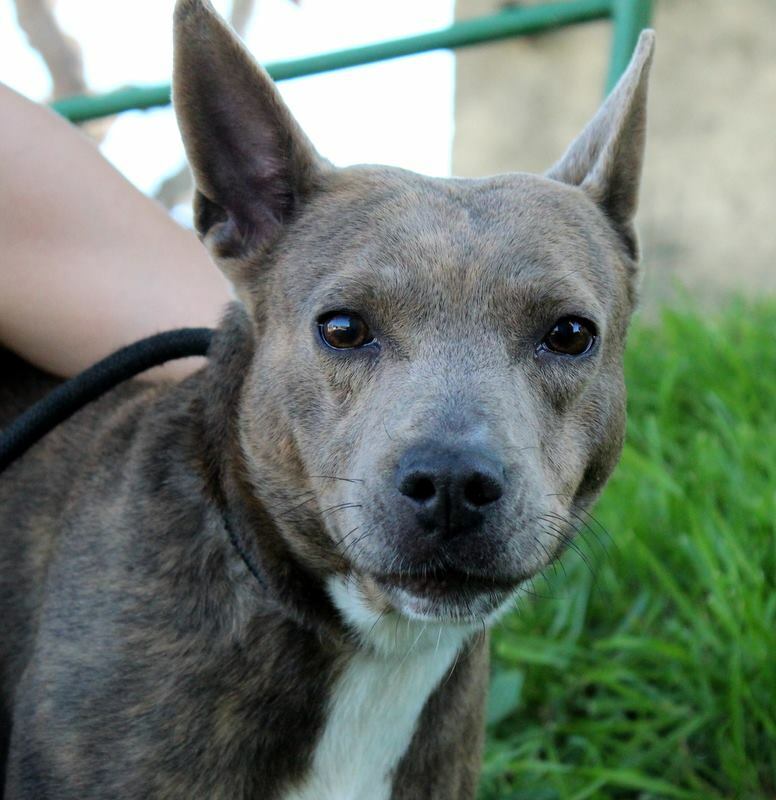 Finally what was perhaps the adoption of the day, that of Violette. Despite the fact that this lovely young malinois was brought in by her owner for rehoming, she is quite (ah-hem) special. Usually dogs who have never been strays and have never been mistreated are quite settled, but Violette is a very complicated girl. She is beautiful, and initially there was a lot of interest in her, however almost all the people who visited her either left empty handed, or left with a different dog. And that includes the IFAW team, as she was one of the dogs who was considered for Benin! However as with all dogs, it is just a question of the right person coming along at the right time. With few exceptions (most notable Vincent), Violette does not like men. However yesterday a man came to meet her, and she seemed to be very relaxed with him. He returned today and the bond was even stronger, so Violette has left for a fabulous life. Her new owner works outdoors and Violette will be with him all the time. What a great change in fortune for her and for today’s other lucky leavers, too. We have our fingers crossed for good news tomorrow, as well, so maybe see you then!